The randomized control trial conducted by Nexleaf with the Mozambique Ministry of Health, VillageReach, PATH, and UNICEF evaluated the “uptimes” of vaccine refrigerators in rural communities. Health facilities using Nexleaf’s remote temperature monitoring (RTM) were evaluated in a controlled trial against facilities using 30 day temperature recorders (30DTR) and facilities using paper charts. 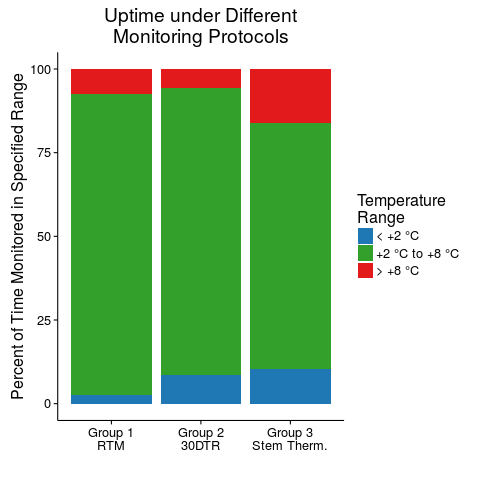 The study was conducted to learn: Do refrigerators with RTM devices capable of sending SMS alerts maintain higher uptimes than refrigerators monitored with 30DTRs or paper charts? Group 1 consisted of 29 health facilities with RTM + SMS alerts; staff received training on responding to RTM alerts, and Standard Operating Procedures (SOPs) were posted in clinics. Group 2 consisted of 28 health facilities monitoring fridges with 30DTR devices; staff received additional training on 30DTR usage. Group 3 consisted of 26 health facilities monitoring fridges with stem thermometers; staff recorded temperatures twice daily on paper charts. Following a ten-month evaluation period, we found that vaccine refrigerators equipped with RTM capable of sending SMS alerts, monitored by trained health care professionals, achieved the highest amount of uptime (90%) and lowest percent of total time spent in WHO freeze alarm state (0.55%). However, Group 2, refrigerators monitored by 30DTR, experienced an average of three hours less in WHO heat alarm state than those with RTM.